After several weeks, I finally had my first opportunity to get my new (to me) QHY247C out under the stars. The conditions weren't the best, average transparency and seeing was 3/5, with 10 mph winds most of the night. But since we have had terrible weather in Southern California lately I was just happy to get out there. 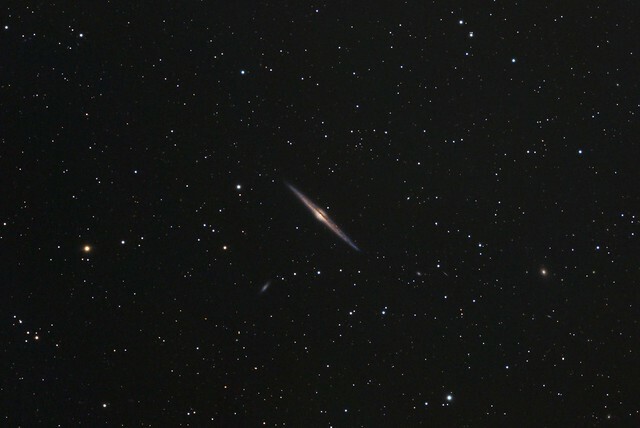 Since my primary target was the Leo Triplet (gathered 3 hours on that to do a shootout comparison with the ASI 071MC-Pro), I only gathered an hour of usable subs on the Needle Galaxy. I must say, I am very impressed with this little camera, as I primarily shoot with an ASI1600MM-Cool and astrodon filters. With ONE measly hour of 3 minute subs in my bortle 5 back yard, with the quarter moon looming over me, I was able to get this result. It won't win any prizes and it is a bit noisy, but I am pretty sure the result is better than I would get with 20 min on each color (no lum) with my Asi1600MM-Cool. Comments and critique welcomed as always. Edited by mistateo, 15 March 2019 - 11:22 AM. Never underestimate OSC . I like the result and regarding the short integration time, Bortle 5 and quarter moon, it is really impressive. Nice image Mistateo. Really turned out nice. Especially for only one hour!